Mike Caruso Signs with Panthers · Let's Go Amerks! The Florida Panthers signed defenceman Mike Caruso to an entry-level contract on Thursday. 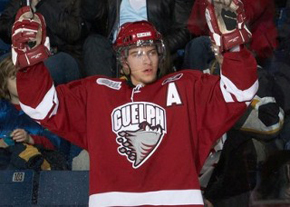 The 20-year-old Caruso, a 2006 fourth-round pick by the Panthers, recently completed his fourth full season in the Ontario Hockey League (OHL) with the Guelph Storm. The Mississauga native totaled 34 points, 10 goals and 24 assists in 62 games played and led the team in plus minus with a +21 rating. Assuming the Florida Panthers are the Amerks’ affiliate next season, there is a good chance that Michael Caruso could be seen in Red, White and Blue within the next season or two.The Florida Panthers have now signed all but one of their 2006 draft picks who need to be signed by May 31st.Â This is important because if they fail to do so, they could lose those players and they go back into the draft-pool. The last player they need to sign is left wing, Michael Frolik. He was the Panthers’ 10th overall draft pick in 2006. Frolik has 138 points (55 goals, 83 assists) in 97 games with the QMJHL’s Rimouski Oceanic over the last two Seasons. Most scouts believe he will be a star in the NHL within a few years. The Florida Panthers have been taking care of business on all levels so far this off-season. Former Amerk, Kamil Kreps was signed to a two-year contract with the Panthers after a good year in the NHL. Wade Belak, who was aquired by the Panthers from the Toronto Maple Leafs at the trade deadline, was also signed for two-years with the Cats. As for the younger players, the Panthers have signed four players who should play in Rochester soon. Luke Beaverson was the first signed. He played six games with the Amerks this year and seemed to be a guy not afraid to play physical. Something the Amerks have been lacking lately. Also signed is Keaton Ellerby, a very promising defenseman who was the Florida Panthers’ 1st round draft pcik (10th overall) in 2007. At 6’4″, the young defenseman needs to put on a little bit of weight at only 190 lbs. But, that seems to be his only real problem. He is seen by scouts as being a tough physical player who is more than willing to drop the gloves and throw some punches. Brady Calla was signed recently by the Panthers as well. He is a good two-way player who can fill a void on the 3rd line. A good fast grinder. With this most recent signing of Mike Caruso, the Panthers are showing they mean business and want to get things done. This is great for the Amerks… assuming the Panthers are going to be stocking the lineup here in Rochester this coming season. Besides waiting for lease and affiliation agreements to be announced, all Amerks’ fans can do right now is assume. And here on LetsGoAmerks, we are going to assume that the Panthers are going to be our parent team until proven otherwise. We are anixously awaiting July 1st when the Panthers can start signing veterans for their AHL team. There are a few things that are needed more than anything to make the Amerks a contender again the the AHL. And veteran players are on the top of that list. LetsGoAmerks will have more updates throughout the rest of the summer and things become more clear. Any lease or affiliation information can be found here.